Thrips feed on a variety of plants including many ornamental, agronomic, vegetable, and wild species. Thrips are very small insects, with adults ranging from 0.5 to 5 mm depending on the species (Jones 2005). Tobacco thrips, Frankliniella fusca (Hinds) (Figure 1), is one of the many species of thrips found throughout Florida. Figure 1. Adult tobacco thrips, Frankliniella fusca (Hinds). Photograph by Lyle Buss, University of Florida. Thrips move into fields from nearby areas, but can also migrate long distances on wind currents (Hurt et al. 2005). Frankliniella fusca can be found all over the United States and Canada east of the Rocky Mountains, and has also been introduced to Martinique, Puerto Rico and the Netherlands (University of Minnesota Extension 2013, Wells et al. 2002). Tobacco thrips are capable of overwintering on certain plant species including but not limited to common chickweed, rye, wheat, and volunteer peanut (Groves et al. 2001, Capinera 2001). Frankliniella fusca is wingless in its larval, prepupal, and pupal stages (University of Minnesota Extension 2013). The larvae are very light yellow, and the prepupa and pupa are yellow as well (University of Minnesota Extension 2013). According to Wells et al. (2002), there are two different wing morphs identified for adult tobacco thrips: macropterous and brachypterous. The macropterous morph (Figure 2) possesses normal wings, while wings are either absent or nonfunctioning in the brachypterous morph (Figure 3). Adult thrips in the family Thripidae are typically 1-2 mm in length (Riley et al. 2011). Females are usually brown or black and the males are yellow, having eight segmented antennae (Figure 4) (University of Minnesota Extension 2013). Figure 2. Adult macropterous female (normal wings), Frankliniella fusca (Hinds). Photograph by Lyle Buss, University of Florida. Figure 3. Adult brachypterous female (reduced/absent wings), Frankliniella fusca (Hinds). Photograph by Lyle Buss, University of Florida. Figure 4. Adult brachypterous male (reduced/absent wings), Frankliniella fusca (Hinds). Photograph by Lyle Buss, University of Florida. Although both morphs can be present in a single population, the abundance of each is linked with seasonality. In a Georgia population, the brachypterous form was more common in fall and winter, and the macropterous form was dominant in spring and summer (Wells et al. 2002). Frankliniella fusca (Hinds) is capable of reproducing parthenogenetically (with unfertilized eggs) but can also mate (Riley et al. 2008). Mated females produce both male and female offspring, while unmated females produce only males (Capinera 2001). Warmer temperatures are thought to increase the thrips’ reproductive cycle, while rainfall has the opposite effect, killing larvae (Morsello et al. 2008). 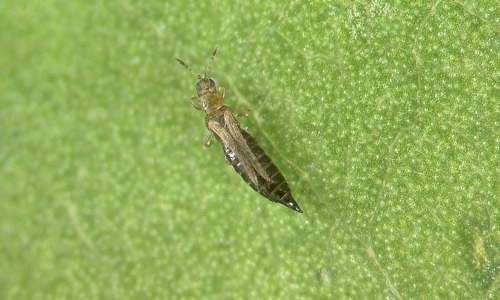 The tobacco thrips’ life cycle consists of the egg, two larval stages, prepupa, pupa, and adult (University of Minnesota Extension 2013). According to Ananthakrishman (1993), most thrips complete their life cycle (egg to adult) in two to three weeks. The egg is inserted into the plant and hatches after three to four days (Riley et al. 2008). 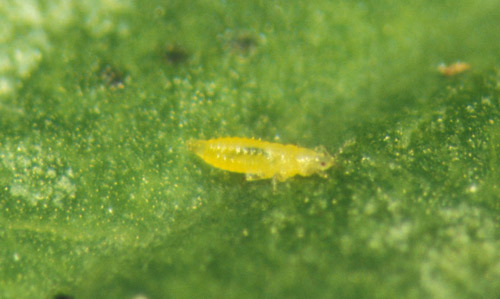 After hatching, the wingless larvae (Figure 4) are unable to leave the plant and begin to feed. In a study by Funderburk et al. (2002), larval populations were found to be highest in late June. The thrips can become infected with Tomato spotted wilt virus (TSWV) only during the two larval stages, but once infected they can vector the disease throughout their adult life (Jones 2005). Figure 5. 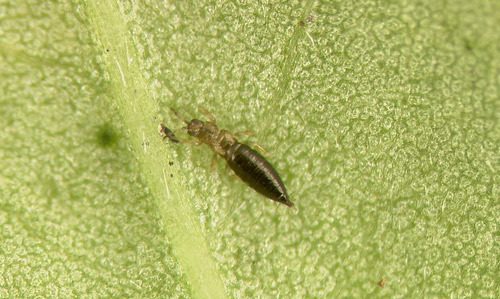 Tobacco thrips larva, Frankliniella fusca (Hinds). Photograph by Lyle Buss, University of Florida. The prepupal stage and pupal stages last approximately 1 and 1.4 days, respectively, and do not feed (Capinera 2001; Riley et al. 2008). The adult thrips live 20-40 days (Jones 2005). Despite the common name (tobacco thrips), Frankliniella fusca feed on various plant species. Known host plants include, but are not limited to, tobacco, watermelon, tomato, sweet pepper, cotton, and peanut (Jones 2005). Like many other thrips species, tobacco thrips feed on the tender, new growth of plants (and seedlings), causing cosmetic damage that can also inhibit growth (Ananthakrishman 1993). Despite the fact that thrips damage crops and other plants through feeding, the increasing concern for many producers is the transmission of tospoviruses such as Tomato spotted wilt virus, which can infect over 600 host plants (Groves et al. 2002). Tospoviruses are transmitted solely by thrips from the family Thripidae and subfamily Thripinae (Riley et al. 2011). Common tospovirus symptoms include chlorosis, leaf speckling/mottling, yellowing, and wilting (Riley et al. 2011). 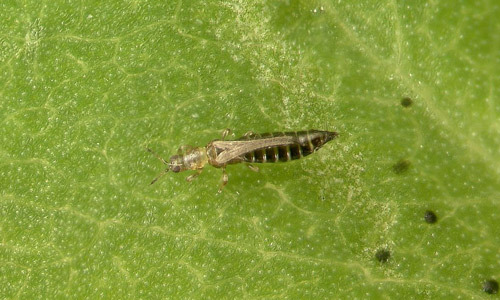 Compared to other species of thrips, tobacco thrips pose a particular threat to host plants (both ornamental and agronomic) due to year-round presence in suitable locations including but not limited to Florida, Georgia, South Carolina and Louisiana (Ananthakrishman 1993, Capinera 2001). Cotton-growing states have been facing increasing control costs and losses over the past several years. Mississippi and Missouri are two states with the highest control costs. Tobacco thrips is one of eight thrips species known to vector Tomato spotted wilt virus (Stumpf and Kennedy 2005). Thrips can only become inoculated with the virus by feeding on an infected plant while in the larval stage, and each new generation of thrips must reacquire the virus (it does not spread between thrips or from parent to offspring) (Riley et al. 2011). After a latent period of three to seven days, the newly infected thrips are able to vector Tomato spotted wilt virus (Groves et al. 2002). The life cycle, species diversity, and unpredictable population variations year to year make it difficult to manage thrips. Several management strategies are undertaken by growers, including seed treatments, foliar sprays, and manipulating planting factors. Funderburk et al. (1998) found that early-season insecticide applications were more effective for controlling larvae than adults. In November 2013, resistance was confirmed in thrips’ populations to thiamethoxam, the active ingredient used in many cotton seed treatments and also used in Cruiser® for soybean and corn treatments (Stewart 2013). Due to this resistance, growers in states such as Tennessee and Arkansas are now using different seed treatments for cotton (Robinson 2014). Tennessee reported losses of 5,824 cotton bales in 2009 and 42,508 bales in 2011 due to tobacco thrips (Robinson 2014). Planting denser crop rows (such as twin rows in peanut) with a higher plant population, compared to the lower plant population associated with a single row pattern, has been shown to reduce thrips injuries in a field setting (Hurt et al. 2005). Thrips populations are naturally suppressed by nematodes in the genus Thripinema, which may be useful as a biological control agent (Fundurburk et al. 2002). Thripinema fuscum is a natural enemy of Frankliniella fusca in peanut (Sims et al. 2005). Female thrips that are parasitized by Thripinema nematodes are rendered sterile (Funderburk 2002). Sims et al. (2009) reported that in parasitized Frankliniella fusca females, the feeding rate was reduced by 65%, and TSWV transmission was reduced by 50%. Female thrips were more likely to be parasitized than males, but parasitism reduced the male lifespan, while that of the female remained unaffected (Sims et al. 2005). Thripinema fuscum has been found to parasitize larval stages and both male and female adults (Sims et al. 2005). Ananthakrishman TN. 1993. Bionomics of thrips. Annual Review of Entomology 38: 71-92. Chaisuekul C, Riley DG. 2005. Host plant, temperature, and photoperiod effects on ovipositional preference of Frankliniella occidentalis and Frankliniella fusca (Thysanoptera: Thripidae). Journal of Economic Entomology 98: 2107-2113. Funderburk JE, Gorbet DW, Teare ID, Stavisky J. 1998. Thrips injury can reduce peanut yield and quality under conditions of multiple stress. Agronomy Journal 90: 563-566. Funderburk J, Stavisky J, Tipping C, Gorbet D, Momoi T, Berger R. 2002. Infection of Frankliniella fusca (Thysanoptera: Thripidae) in peanut by the parasitic nematode Thripinema fuscum (Tylenchidae: Allantonematidae). Environmental Entomology 31: 558-563. Groves RL, Walgenbach JF, Moyer JW, Kennedy GG. 2001. Overwintering of Frankliniella fusca (Thysanoptera: Thripidae) on winter annual weeds infected with Tomato spotted wilt virus and patterns of virus movement between susceptible weed hosts. Phytopathology 91: 891-899. Groves RL, Walgenbach JF, Moyer JW, Kennedy GG. 2002. The role of weed hosts and tobacco thrips, Frankliniella fusca in the epidemiology of Tomato spotted wilt virus. Plant Disease 86: 573-582. Hurt CA, Brandenburg RL, Jordan DL, Kennedy GG, Bailey JE. 2005. Management of spotted wilt vectored by Frankliniella fusca (Thysanoptera: Thripidae) in Virginia market-type peanut. Journal of Economic Entomology 98: 1435-1440. Jones DR. 2005. Plant viruses transmitted by thrips. European Journal of Plant Pathology 113: 119-157. Morsello SC, Groves RL, Nault BA, Kennedy GG. 2008. Temperature and precipitation affect seasonal patterns of dispersing tobacco thrips, Frankliniella fusca, and onion thrips, Thrips tabaci (Thysanoptera: Thripidae) caught on sticky traps. Environmental Entomology 37: 79-86. Riley D, McPherson R, Wells L. (2008). 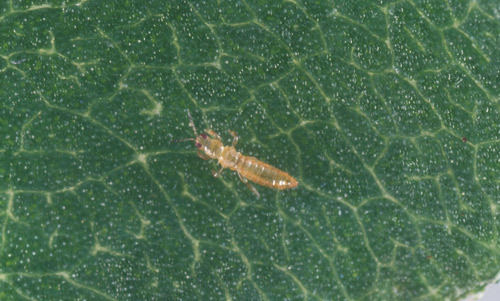 Thrips vectors of TSWV. University of Georgia College of Agricultural and Environmental Sciences. (8 November 2018). Riley DG, Joseph SV, Srinivasan R, Diffie S. 2011. Thrips vectors of tospoviruses. Integrated Pest Management 1: 1-10. Robinson E. (2014). Scientists investigating tolerance to thiamethoxam in mid-south. Delta Farm Press. (8 November 2018). Sims K, Funderburk J, Boucias D. 2005. Host-parasite biology of Thipinema fuscum (Tylenchida: Allantonematidae) and Frankliniella fusca (Thysanoptera: Thripidae). Journal of Nematology 37: 4-11. Sims KR, Funderburk JE, Reitz SR, Boucias DG. 2009. The impact of a parasitic nematode, Thripinema fuscum, on the feeding behavior and vector competence of Frankliniella fusca. Entomologia Experimentalis et Applicata 132: 200-208. Stewart S. (2013). Tobacco thrips resistance to Cruiser cottonseed treatment confirmed in Tennessee. Southeast Farm Press. (8 November 2018). Stumpf CF, Kennedy GG. 2005. Effects of Tomato spotted wilt virus (TSWV) isolates, host plants, and temperature on survival, size, and development time on Frankliniella fusca. Entomologia Experimentalis et Applicata 114: 215-225. University of Minnesota Extension. (2013). Tobacco thrips. University of Minnesota Extension. (8 November 2018). Wells ML, Culbreath AK, Todd JW, Csinos AS, Mandal B, McPherson RM. 2002. Dynamics of spring tobacco thrips (Thysanoptera: Thripidae) populations: Implications for Tomato spotted wilt virus management. Environmental Entomology 31: 1282-1290. Authors: Ethan Carter, Agronomy Department, Jennifer L. Gillett-Kaufman, Entomology and Nematology Department, University of Florida. Publication Date: September 2015. Reviewed: November 2018.